CCC last year reported research finding that the actual cost to repair ADAS-equipped vehicles could be less than that of counterparts without the technology under certain crash circumstances. In this year’s free “Crash Course,” CCC attacked the topic from a different angle. It used its own “proprietary methodology” to calculate change in velocity in claims regarding pools of two OEMs’ 2016-18 vehicles, one set sporting ADAS, one set without it. Velocity change, known as “delta-V,” is an important measurement of how bad a crash is. Going from 80 mph to 0 mph because you hit a boulder that fell on the freeway carries a high delta-V. 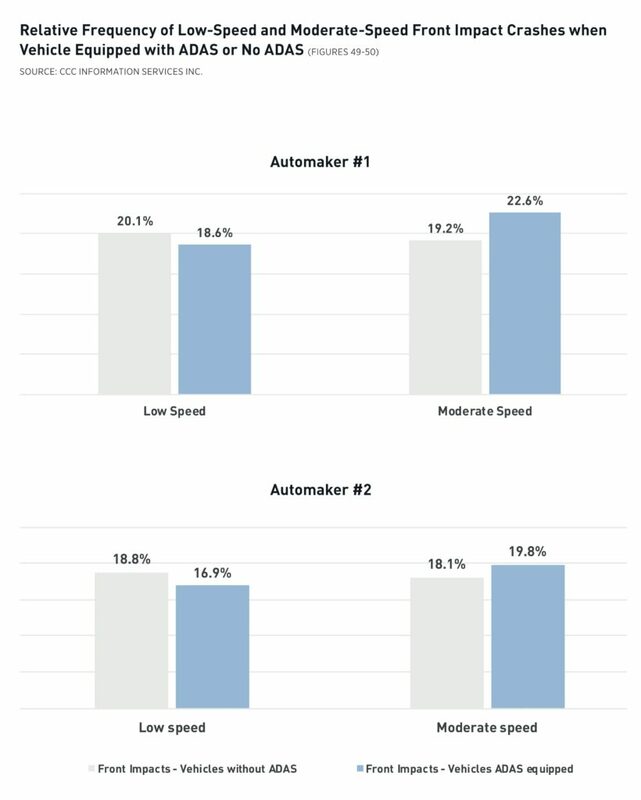 Dropping from 2 mph to 0 mph because you nudged your garage wall delivers a low delta-V.
“The ADAS equipped vehicles with a front impact for both automakers show a smaller share of volume within both the lowest and highest Delta-V ranges, suggesting ADAS may be helping prevent low speed crashes altogether, and slowing the speed of the vehicle prior to impact for those crashes that otherwise might have had higher Delta-V’s,” CCC wrote. The number of moderate-speed collisions rose for the ADAS-equipped vehicles. CCC director, analyst and lead “Crash Course” author Susana Gotsch explained that higher-speed collisions were likely being mitigated down to the moderate-speed category. “Once you get above a midrange, a lot of those end up being totals,” Gotsch also noted in an interview. The findings suggest an interesting ramification for shop business mixes if they’re indeed applicable to the rest of a fleet guaranteed to grow in ADAS. Fewer low-speed crashes and more moderate-speed work in the industry could have an impact on shop needs and logistics. For example, if there’s less low-speed hits to turn around quickly, what does that mean for a shop owner? Does it affect compensation structure for the average body technician or painter? Food for thought as ADAS expands through the next decade. 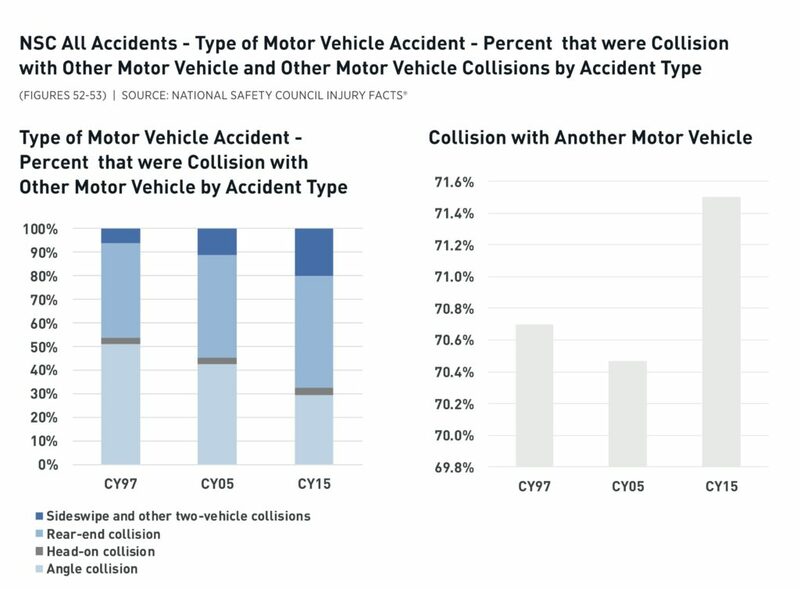 Citing National Highway Traffic Safety Administration data, CCC said rear-ending crashes were the most common type found in police reports.